The Huawei Honor 8 lite is a powerful device, gaining great popularity and demand due to its highly advanced features and powerful camera. Huawei new and innovative campaign is solely about gifting an Honor 8 to someone who you think truly deserves the best. In this campaign, a series of posts will go up. By sharing the Honor 8lite video and nominating someone with the story of your best received gift, customers will have the chance to get their nominee an Honor 8lite. This series will continue from 10th – 13th March and the next day two lucky winners will be rewarded with an Honor 8lite. The winning criteria is that ten people will be shortlisted based on completion of tasks mentioned in the posts, as well as the story shared. The Marketing Manager of Huawei Salman Javed, stated that; “With this great new device Huawei has really impressed various consumer segments. Therefore, this new campaign is based on Huawei’s vision of truly satisfying the customers. 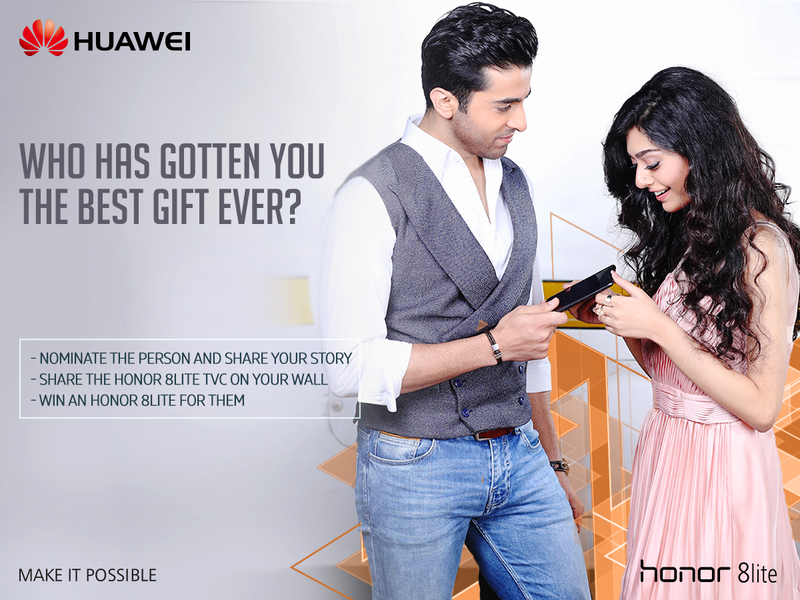 With the story of the best gift received, Huawei wants to give its customers a chance to gift their loved ones back”. The Honor 8lite enriched with a revolutionary 12 MP back-camera, an f/2.2 aperture and autofocus, along with an 8 MP front-camera with a 77-degree wide-angle lens, is perfect for selfies. The device is powered by the high-performance ‘Kirin 655 octa-core Processor’, paired with 3GB RAM and a long-lasting 3000mAh battery. It is designed to fulfill the evolving needs of the photography enthusiasts and socially active consumers. The device delivers extremely fast performance while delivering excellence in means of comfort, style, and camera, thus generating an overwhelming response from the Pakistan market too. All Huawei fans now have the perfect opportunity to win this amazing device by participating in the contest. Youcan get further updates from Huawei’s official facebook and Instagram pages.